I have been riding fixed gear for about 5 years and I have always ridden with brakes. My first bike utilized a suicide hub (an old thread on freewheel hub with a track cog and an lock ring) on a 1981 Nishiki Competition, a nice bike. I spun the cog off multiple times before accepting I would not be able to skid stop. I road some old Normandy hubs laced to Araya rims for many years. 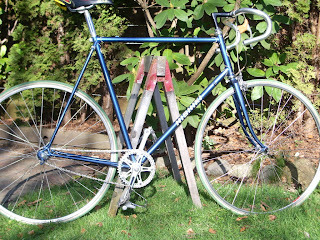 Eventually, those original wheels made it onto a 1975 Jeunet made of Reynolds 531 steel, which was a lot more fun than the Nishiki though it was more of a “sport” bike than a race bike. I always believed it was the 531 that made the difference. The Jeunet was flawed though. It had been repainted and braze-ons were added in the 1980s. I filed the retrofitted shifter bosses off as I sometimes got caught on them when skidding. This bike was a general all weather beater and this took its toll on the hubs and wheels. Eventually I had to retire the old wheels and it was time for a real set of track hubs. What is more tried, tested and true than Phil Wood? Nothing. I built up three cross 36 hole wheels with DT Swiss spokes to Nisi Mixer rims harvested from and all original 1988 Marinoni with low miles. Being from France and the mid seventies, the Jeunet had French threading, but the bottom bracket had been tapped to Italian at some point. The threads were a mess and it was always a challenge to change bottom brackets which happened from time to time as I did maintenance or swapped cranks. At one point I cracked a vintage TA specialties non-drive crank arm. The Jeunet was tired and I wanted something with forged dropouts instead of the stamped ones it had. So I kept my eye out for a particular type of frame. I wanted something from the mid-1970s to early 1980s because that is the period when the following features were most common: clearance for full wrap fenders and eyelets for fenders, forged dropouts, fewer braze-ons (especially not for shifters), and Reynolds 531 double butted steel. Lastly, the frame would need to be English threaded. An interesting bike caught my eye on used Victoria in the summer of 2010. It was a Mairag, made in Switzerland. The seller had used a photo of perhaps the only Mairag documented on English internet and advertised Zeus components. The price was good for a potential flip and strip and I knew some people the frame might fit. Of course, I was assuming the photo was the bike for sale and estimated the size based on that. When I showed up I found a bike in my size meeting the above criteria though lacking the fender eyelets on the front fork. Close enough. I bought it and stripped and hung the frame up to wait for a time when I could swap the parts from the Jeunet. I had Fairfield Cycles braze on some eyelets. Back to the Jeunet, the Nisi rims did well until a dark night on an unfamiliar road brought me right on top of a chasm of a pothole formed at the seam of two different asphalt applications. It left such a massive flat spot in the rear rim the bike almost audibly thumped when riding, but miraculously did not flat. Not having a rim on hand to rebuild the rear wheel I build the Jeunet up as a single speed with spare parts and sold it. My new fixed gear would come later. After several months I took the frame to Jim at J&B auto parts group on Oak Street in Victoria and asked him to replicate the original paint colour, while masking the head badge. I ordered a Mavic open pro rim in grey anodizing to rebuild the rear wheel and did so with DT Swiss double butted spokes. I knew from all my headaches with old cranks that I wanted something more dependable and when some 172.5mm Ultegra Octalink cranks fell into my lap I simply ordered an appropriate track ring for them. Being that this was a fresh build I wanted to have fun with it. I decided a brown on pearl colour scheme would be great with my Brooks Professional Saddle and ordered some Fixation brown on white tires and a set of wooden grips to finish it off. The Nitto bars are based on Italian Café bars from the 1960s and 1970s and I had procured them from an old Sekine city bike and always wanted to give them a try. The Chris King headset I traded for with a Super Record and it had been waiting for the right project. I also had the first generation super record post fall into my lap for $10 at the Oak Bay Bicycles Swap meet last summer. The new fixed gear was born with every intention of putting the moustache bars with Campy Record brakes and some alloy fenders back on. However, as I road it the first few times to show it off and take some photos something happened. I actually enjoyed the new awareness that riding brakeless brought. It required a greater appreciation for the road around you and paying extra attention. Though it was slower the simplicity was appealing. So as we wait for the Victoria summer to finally take hold I’ll be riding brakeless and fenderless till next winter.